Dawn’s first day in Ireland and the new book is published!!! Well, it’s been an absolutely whirlwind 36 hours. Luckily I checked my emails while I was trying to tidy the house in preparation for Dawn’s arrival only to discover I’d made a mistake with the time she was landing. I had to actually get up at 4am yesterday in order to leave for the airport at 5am and then when I got to Dublin her flight was early, thank goodness I checked or else she could still be wandering around the airport!!! 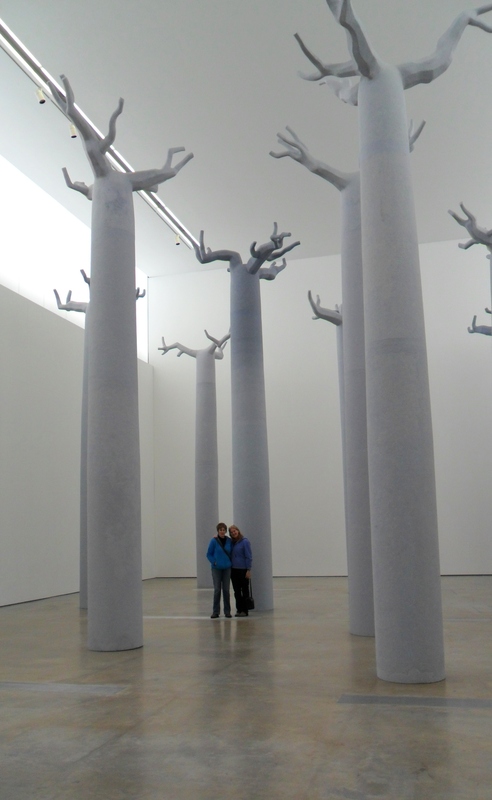 Dawn and Eileen MacDonagh are dwarfed by Eileen's amazing installation 'Cathedral'! Eileen has over 40 tonnes of stone and amazing other sculptures on exhibition at the Visual Centre for Contemporary Art in Carlow Town, miss it at your peril!!! I do want to keep everyone up to date with what’s happening here at the moment but honestly it’s just so action packed it’s really difficult to know where to start and there are not enough hours in the day to write everything down, I also want to relax and enjoy the next couple of weeks! Dawn and I will both be taking pictures every day so do check out Dawn’s new FB album and when Chrissie Day arrives on Friday evening I’ll expect we’ll both have no voices left. Last night Chrissie and I finally put our new book to bed, ‘Nuno Felting with Chrissie Day and Nicola Brown’ is now officially available to order in soft back, we’re just sorting out logistics (IBSN numbers etc.) and then it’ll be available in hard back and an eBook version for iPads and iPhones, please bear with us! One set of downloadable templates for 5 of the tops featured in this book are available free to order in a size of their choice for each purchaser of ‘Nuno Felting with Chrissie Day and Nicola Brown‘, instructions for accessing these are in the book. Starting with the basics, topics covered include adding design to fabrics using deconstructed screenprinting, the use of an electric sander and discovering how to utilise a tumble dryer in order to eliminate the traditional rubbing and rolling stage of the nuno felting process altogether. Here’s the link to preview or order the book, we hope that you like it! This entry was posted in Book, Book with Chrissie, Felt and tagged Dawn Edwards, Eileen MacDonagh, Felt, Felting, nuno felt, nuno felt book, nuno felting book by Nicola. Bookmark the permalink.